S trim, BLACK exterior and TITAN BLACK CLOTH interior. Turbo, Alloy Wheels, iPod/MP3 Input, Back-Up Camera, Bluetooth. CLICK NOW! KEY FEATURES INCLUDE Back-Up Camera, Turbocharged, iPod/MP3 Input, Bluetooth, Aluminum Wheels MP3 Player, Keyless Entry, Child Safety Locks, Steering Wheel Controls, Electronic Stability Control. Volkswagen S with BLACK exterior and TITAN BLACK CLOTH interior features a 4 Cylinder Engine with 147 HP at 5000 RPM*. WHO WE ARE Live Free, Drive Fremont. Prices shown reflect lease incentives. Must lease through VW credit and qualify for all applied incentives. Horsepower calculations based on trim engine configuration. Please confirm the accuracy of the included equipment by calling us prior to purchase. TORNADO RED exterior and TITAN BLACK CLOTH interior, S trim. Bluetooth, DRIVER ASSISTANCE PACKAGE, Aluminum Wheels, Turbo Charged AND MORE! KEY FEATURES INCLUDE Back-Up Camera, Turbocharged, iPod/MP3 Input, Bluetooth, Aluminum Wheels MP3 Player, Keyless Entry, Child Safety Locks, Steering Wheel Controls, Electronic Stability Control. OPTION PACKAGES DRIVER ASSISTANCE PACKAGE Blind Spot Monitor w/Rear Traffic Alert, Heated Side Mirrors, Forward Collision Warning, Autonomous Emergency Braking (AEB) and pedestrian monitoring. Volkswagen S with TORNADO RED exterior and TITAN BLACK CLOTH interior features a 4 Cylinder Engine with 147 HP at 5000 RPM*. WHO WE ARE Live Free, Drive Fremont. Prices shown reflect lease incentives. Must lease through VW credit and qualify for all applied incentives. Horsepower calculations based on trim engine configuration. Please confirm the accuracy of the included equipment by calling us prior to purchase. SILK BLUE METALLIC exterior and TITAN BLACK CLOTH interior, S trim. Smart Device Integration, Bluetooth, DRIVER ASSISTANCE PACKAGE CLICK NOW! KEY FEATURES INCLUDE Back-Up Camera, Turbocharged, iPod/MP3 Input, Bluetooth, Aluminum Wheels, Smart Device Integration. MP3 Player, Keyless Entry, Child Safety Locks, Steering Wheel Controls, Electronic Stability Control. OPTION PACKAGES DRIVER ASSISTANCE PACKAGE Blind Spot Monitor w/Rear Traffic Alert, Heated Side Mirrors, Forward Collision Warning, Autonomous Emergency Braking (AEB) and pedestrian monitoring. Volkswagen S with SILK BLUE METALLIC exterior and TITAN BLACK CLOTH interior features a 4 Cylinder Engine with 147 HP at 5000 RPM*. BUY FROM AN AWARD WINNING DEALER Live Free, Drive Fremont. Prices shown reflect lease incentives. Must lease through VW credit and qualify for all applied incentives. Horsepower calculations based on trim engine configuration. Please confirm the accuracy of the included equipment by calling us prior to purchase. S trim, PURE WHITE exterior and TITAN BLACK CLOTH interior. Smart Device Integration, Bluetooth, DRIVER ASSISTANCE PACKAGE, Turbo SEE MORE! KEY FEATURES INCLUDE Back-Up Camera, Turbocharged, iPod/MP3 Input, Bluetooth, Aluminum Wheels, Smart Device Integration MP3 Player, Keyless Entry, Child Safety Locks, Steering Wheel Controls, Electronic Stability Control. OPTION PACKAGES DRIVER ASSISTANCE PACKAGE Blind Spot Monitor w/Rear Traffic Alert, Heated Side Mirrors, Forward Collision Warning, Autonomous Emergency Braking (AEB) and pedestrian monitoring. Volkswagen S with PURE WHITE exterior and TITAN BLACK CLOTH interior features a 4 Cylinder Engine with 147 HP at 5000 RPM*. WHY BUY FROM US Live Free, Drive Fremont. Prices shown reflect lease incentives. Must lease through VW credit and qualify for all applied incentives. Horsepower calculations based on trim engine configuration. Please confirm the accuracy of the included equipment by calling us prior to purchase. Bluetooth, Smart Device Integration, Alloy Wheels, DRIVER ASSISTANCE PACKAGE, Turbo, iPod/MP3 Input, Back-Up Camera. S trim. READ MORE! KEY FEATURES INCLUDE Back-Up Camera, Turbocharged, iPod/MP3 Input, Bluetooth, Aluminum Wheels, Smart Device Integration MP3 Player, Keyless Entry, Child Safety Locks, Steering Wheel Controls, Electronic Stability Control. OPTION PACKAGES DRIVER ASSISTANCE PACKAGE Blind Spot Monitor w/Rear Traffic Alert, Heated Side Mirrors, Forward Collision Warning, Autonomous Emergency Braking (AEB) and pedestrian monitoring. Volkswagen S with PURE WHITE exterior and TITAN BLACK CLOTH interior features a 4 Cylinder Engine with 147 HP at 5000 RPM*. WHY BUY FROM US Live Free, Drive Fremont. Prices shown reflect lease incentives. Must lease through VW credit and qualify for all applied incentives. Horsepower calculations based on trim engine configuration. Please confirm the accuracy of the included equipment by calling us prior to purchase. PURE WHITE exterior and TITAN BLACK CLOTH GOLF interior, S trim. Bluetooth, Alloy Wheels, Turbo, iPod/MP3 Input, Back-Up Camera. AND MORE! KEY FEATURES INCLUDE Back-Up Camera, Turbocharged, iPod/MP3 Input, Bluetooth, Aluminum Wheels MP3 Player, Keyless Entry, Child Safety Locks, Steering Wheel Controls, Heated Mirrors. Volkswagen S with PURE WHITE exterior and TITAN BLACK CLOTH GOLF interior features a 4 Cylinder Engine with 170 HP at 4500 RPM*. WHY BUY FROM US Live Free, Drive Fremont. Prices shown reflect lease incentives. Must lease through VW credit and qualify for all applied incentives. Horsepower calculations based on trim engine configuration. Please confirm the accuracy of the included equipment by calling us prior to purchase. Moonroof, Heated Seats, Keyless Start, Back-Up Camera. SE trim, SILK BLUE METALLIC exterior and BLACK LEATHERETTE interior. READ MORE! KEY FEATURES INCLUDE Sunroof, Heated Driver Seat, Back-Up Camera, Turbocharged, Satellite Radio, iPod/MP3 Input, CD Player, Onboard Communications System, Aluminum Wheels, Keyless Start, Heated Seats. MP3 Player, Keyless Entry, Steering Wheel Controls, Child Safety Locks, Heated Mirrors. Volkswagen SE with SILK BLUE METALLIC exterior and BLACK LEATHERETTE interior features a 4 Cylinder Engine with 170 HP at 4500 RPM*. VISIT US TODAY Live Free, Drive Fremont. Prices shown reflect lease incentives. Must lease through VW credit and qualify for all applied incentives. Horsepower calculations based on trim engine configuration. Please confirm the accuracy of the included equipment by calling us prior to purchase. Moonroof, Heated Seats, Smart Device Integration, Cross-Traffic Alert. TORNADO RED exterior and BLACK LEATHERETTE interior, SE trim. SEE MORE! KEY FEATURES INCLUDE Sunroof, Heated Driver Seat, Back-Up Camera, Turbocharged, iPod/MP3 Input, Bluetooth, Aluminum Wheels, Keyless Start, Dual Zone A/C, Smart Device Integration, Cross-Traffic Alert, Blind Spot Monitor, Heated Seats. MP3 Player, Keyless Entry, Steering Wheel Controls, Child Safety Locks, Heated Mirrors. OPTION PACKAGES COMBINATION ASSISTANCE KIT First Aid Kit Basic first aid kit for addressing minor injuries, Roadside Assistance Kit, booster cables, warning triangle, LED flashlight, work gloves, multi-tool, and more. Volkswagen SE with TORNADO RED exterior and BLACK LEATHERETTE interior features a 4 Cylinder Engine with 147 HP at 5000 RPM*. BUY FROM AN AWARD WINNING DEALER Live Free, Drive Fremont. Prices shown reflect lease incentives. Must lease through VW credit and qualify for all applied incentives. Horsepower calculations based on trim engine configuration. Please confirm the accuracy of the included equipment by calling us prior to purchase. S trim, TORNADO RED exterior and TITAN BLACK CLOTH interior. Cross-Traffic Alert, Blind Spot Monitor, Back-Up Camera, Aluminum Wheels READ MORE! KEY FEATURES INCLUDE Back-Up Camera, Turbocharged, iPod/MP3 Input, Bluetooth, CD Player, Aluminum Wheels, Cross-Traffic Alert, Blind Spot Monitor. Rear Spoiler, MP3 Player, Keyless Entry, Steering Wheel Controls, Heated Mirrors. Volkswagen S with TORNADO RED exterior and TITAN BLACK CLOTH interior features a 4 Cylinder Engine with 174 HP at 5000 RPM*. WHY BUY FROM US Live Free, Drive Fremont. Prices shown reflect lease incentives. Must lease through VW credit and qualify for all applied incentives. Horsepower calculations based on trim engine configuration. Please confirm the accuracy of the included equipment by calling us prior to purchase. Sunroof, Heated Seats, Keyless Start, Dual Zone A/C. SE trim, PLATINUM GRAY METALLIC exterior and TITAN BLACK V-TEX interior. CLICK NOW! KEY FEATURES INCLUDE Sunroof, Heated Driver Seat, Back-Up Camera, Turbocharged, Satellite Radio, iPod/MP3 Input, CD Player, Onboard Communications System, Aluminum Wheels, Keyless Start, Dual Zone A/C, Cross-Traffic Alert, Blind Spot Monitor, Hands-Free Liftgate, Smart Device Integration. Rear Spoiler, MP3 Player, Keyless Entry, Steering Wheel Controls, Heated Mirrors. OPTION PACKAGES CHROME EXHAUST TIPS (SET OF 2). Volkswagen SE with PLATINUM GRAY METALLIC exterior and TITAN BLACK V-TEX interior features a 4 Cylinder Engine with 174 HP at 5000 RPM*. VISIT US TODAY Live Free, Drive Fremont. Prices shown reflect lease incentives. Must lease through VW credit and qualify for all applied incentives. Horsepower calculations based on trim engine configuration. Please confirm the accuracy of the included equipment by calling us prior to purchase. DEEP BLACK PEARL EFFECT exterior and TITAN BLACK CLOTH interior, S trim. Bluetooth, Smart Device Integration, Turbo Charged. SEE MORE! KEY FEATURES INCLUDE All Wheel Drive, Back-Up Camera, Turbocharged, iPod/MP3 Input, Bluetooth, Aluminum Wheels, Smart Device Integration Rear Spoiler, MP3 Player, Keyless Entry, Privacy Glass, Steering Wheel Controls. OPTION PACKAGES DRIVER ASSISTANCE PACKAGE Blind Spot Monitor w/Rear Traffic Alert, Forward Collision Warning, autonomous emergency braking w/pedestrian monitoring (front assist). Volkswagen S with DEEP BLACK PEARL EFFECT exterior and TITAN BLACK CLOTH interior features a 4 Cylinder Engine with 184 HP at 4400 RPM*. VISIT US TODAY Live Free, Drive Fremont. Prices shown reflect lease incentives. Must lease through VW credit and qualify for all applied incentives. Horsepower calculations based on trim engine configuration. Please confirm the accuracy of the included equipment by calling us prior to purchase. S trim, PLATINUM GRAY METALLIC exterior and TITAN BLACK CLOTH interior. Bluetooth, Smart Device Integration, Turbo Charged Engine CLICK NOW! KEY FEATURES INCLUDE All Wheel Drive, Back-Up Camera, Turbocharged, iPod/MP3 Input, Bluetooth, Aluminum Wheels, Smart Device Integration. Rear Spoiler, MP3 Player, Keyless Entry, Privacy Glass, Steering Wheel Controls. OPTION PACKAGES DRIVER ASSISTANCE PACKAGE Blind Spot Monitor w/Rear Traffic Alert, Forward Collision Warning, autonomous emergency braking w/pedestrian monitoring (front assist). Volkswagen S with PLATINUM GRAY METALLIC exterior and TITAN BLACK CLOTH interior features a 4 Cylinder Engine with 184 HP at 4400 RPM*. WHO WE ARE Live Free, Drive Fremont. Prices shown reflect lease incentives. Must lease through VW credit and qualify for all applied incentives. Horsepower calculations based on trim engine configuration. Please confirm the accuracy of the included equipment by calling us prior to purchase. Heated Seats, Blind Spot Monitor, Cross-Traffic Alert. TORNADO RED W/BLACK TOP exterior and TITAN BLACK V-TEX interior, S trim. READ MORE! KEY FEATURES INCLUDE Heated Driver Seat, Back-Up Camera, Turbocharged, iPod/MP3 Input, Bluetooth, CD Player, Aluminum Wheels, Cross-Traffic Alert, Blind Spot Monitor, Heated Seats Rear Spoiler, MP3 Player, Keyless Entry, Steering Wheel Controls, Rollover Protection System. Volkswagen S with TORNADO RED W/BLACK TOP exterior and TITAN BLACK V-TEX interior features a 4 Cylinder Engine with 174 HP at 5000 RPM*. WHO WE ARE Live Free, Drive Fremont. Prices shown reflect lease incentives. Must lease through VW credit and qualify for all applied incentives. Horsepower calculations based on trim engine configuration. Please confirm the accuracy of the included equipment by calling us prior to purchase. NAV, Heated Seats, Sunroof. 2.0T SE w/Technology trim, DEEP BLACK PEARL EFFECT exterior and TITAN BLACK LEATHERETTE interior CLICK ME! KEY FEATURES INCLUDE Navigation, Sunroof, Heated Driver Seat, Heated Rear Seat, Back-Up Camera, Turbocharged, Satellite Radio, iPod/MP3 Input, CD Player, Onboard Communications System, Aluminum Wheels, Remote Engine Start, Dual Zone A/C, Heated Seats MP3 Player, Keyless Entry, Steering Wheel Controls, Child Safety Locks, Electronic Stability Control. Volkswagen 2.0T SE w/Technology with DEEP BLACK PEARL EFFECT exterior and TITAN BLACK LEATHERETTE interior features a 4 Cylinder Engine with 174 HP at 5000 RPM*. EXPERTS ARE SAYING Approx. Original Base Sticker Price: $30,800*. WHO WE ARE Live Free, Drive Fremont. Prices shown reflect lease incentives. Must lease through VW credit and qualify for all applied incentives. Pricing analysis performed on 4/11/2019. Horsepower calculations based on trim engine configuration. Please confirm the accuracy of the included equipment by calling us prior to purchase. Sunroof, Heated Seats, Dual Zone A/C, Keyless Start. V6 GT trim, DEEP BLACK PEARL EFFECT exterior and TITAN BLACK W/ MOONROCK interior. READ MORE! KEY FEATURES INCLUDE Sunroof, Heated Driver Seat, Back-Up Camera, Satellite Radio, iPod/MP3 Input, Bluetooth, CD Player, Aluminum Wheels, Keyless Start, Dual Zone A/C, Heated Seats Rear Spoiler, MP3 Player, Keyless Entry, Steering Wheel Controls, Child Safety Locks. Volkswagen V6 GT with DEEP BLACK PEARL EFFECT exterior and TITAN BLACK W/ MOONROCK interior features a V6 Cylinder Engine with 280 HP at 6200 RPM*. MORE ABOUT US Live Free, Drive Fremont. Prices shown reflect lease incentives. Must lease through VW credit and qualify for all applied incentives. Pricing analysis performed on 4/11/2019. Horsepower calculations based on trim engine configuration. Please confirm the accuracy of the included equipment by calling us prior to purchase. Heated Seats, Third Row Seat, Keyless Start, Dual Zone A/C. SE trim, DEEP BLACK PEARL EFFECT exterior and BLACK LEATHERETTE interior CLICK NOW! KEY FEATURES INCLUDE Third Row Seat, Heated Driver Seat, Back-Up Camera, Turbocharged, Satellite Radio, iPod/MP3 Input, Bluetooth, CD Player, Aluminum Wheels, Keyless Start, Dual Zone A/C, Smart Device Integration, Blind Spot Monitor, Heated Seats Rear Spoiler, MP3 Player, Privacy Glass, Keyless Entry, Steering Wheel Controls. Volkswagen SE with DEEP BLACK PEARL EFFECT exterior and BLACK LEATHERETTE interior features a 4 Cylinder Engine with 184 HP at 4400 RPM*. VISIT US TODAY Live Free, Drive Fremont. Prices shown reflect lease incentives. Must lease through VW credit and qualify for all applied incentives. Horsepower calculations based on trim engine configuration. Please confirm the accuracy of the included equipment by calling us prior to purchase. Heated Seats, Navigation, Moonroof, Hands-Free Liftgate. SE trim, DEEP BLACK PEARL EFFECT exterior and TITAN BLACK V-TEX interior AND MORE! KEY FEATURES INCLUDE Sunroof, Heated Driver Seat, Back-Up Camera, Turbocharged, Keyless Start, Dual Zone A/C, Cross-Traffic Alert, Blind Spot Monitor, Hands-Free Liftgate, Heated Seats. Rear Spoiler, Keyless Entry, Steering Wheel Controls, Electronic Stability Control, Heated Mirrors. OPTION PACKAGES SE PREMIUM PACKAGE LED Rear License Plate Lights, Front & Rear Park Distance Control (Park Pilot), Halogen Front Fog Lights, low-speed corner illumination feature, LED Tail Lights, 18 Disc Alloy Wheels, Radio: AM/FM/HD 6.3 Touch Nav w/WMA/MP3/FLAC/CD, Discover Media, USB, aux-in, voice control, Fender premium audio system w/subwoofer, VW Car-Net App-Connect smartphone integration and interface (w/Apple CarPlay, Android Auto and MirrorLink), VW Car-Net Security and Service connected car service (limited subscription), VW Car-Net Guide and Inform enhanced navigation and infotainment (subscription required), Bluetooth connectivity and SiriusXM satellite radio (limited-time trial subscription), Bi-Xenon Headlights, LED Daytime Running Lights (DRL), Tires: 18 AS. Volkswagen SE with DEEP BLACK PEARL EFFECT exterior and TITAN BLACK V-TEX interior features a 4 Cylinder Engine with 174 HP at 5000 RPM*. OUR OFFERINGS Live Free, Drive Fremont. Prices shown reflect lease incentives. Must lease through VW credit and qualify for all applied incentives. Horsepower calculations based on trim engine configuration. Please confirm the accuracy of the included equipment by calling us prior to purchase. Heated Seats, Smart Device Integration. DEEP BLACK PEARL EFFECT exterior and TITAN BLACK CLOTH interior, 35th Anniversary Edition trim. SEE MORE! KEY FEATURES INCLUDE Heated Driver Seat, Heated Rear Seat, Back-Up Camera, Turbocharged, iPod/MP3 Input, Bluetooth, Aluminum Wheels, Keyless Start, Dual Zone A/C, Smart Device Integration, Brake Actuated Limited Slip Differential, Blind Spot Monitor, Cross-Traffic Alert, Heated Seats Rear Spoiler, MP3 Player, Keyless Entry, Steering Wheel Controls, Child Safety Locks. OPTION PACKAGES GLI MONSTER MATS W/LOGO (SET OF 4) Heavy Duty Trunk Liner w/VW CarGo Blocks. Volkswagen 35th Anniversary Edition with DEEP BLACK PEARL EFFECT exterior and TITAN BLACK CLOTH interior features a 4 Cylinder Engine with 228 HP at 4700 RPM*. WHY BUY FROM US Live Free, Drive Fremont. Prices shown reflect lease incentives. Must lease through VW credit and qualify for all applied incentives. Horsepower calculations based on trim engine configuration. Please confirm the accuracy of the included equipment by calling us prior to purchase. Heated Seats, Smart Device Integration. DEEP BLACK PEARL EFFECT exterior and TITAN BLACK CLOTH interior, 35th Anniversary Edition trim CLICK ME! KEY FEATURES INCLUDE Heated Driver Seat, Heated Rear Seat, Back-Up Camera, Turbocharged, iPod/MP3 Input, Bluetooth, Aluminum Wheels, Keyless Start, Dual Zone A/C, Smart Device Integration, Brake Actuated Limited Slip Differential, Blind Spot Monitor, Cross-Traffic Alert, Heated Seats Rear Spoiler, MP3 Player, Keyless Entry, Steering Wheel Controls, Child Safety Locks. Volkswagen 35th Anniversary Edition with DEEP BLACK PEARL EFFECT exterior and TITAN BLACK CLOTH interior features a 4 Cylinder Engine with 228 HP at 4700 RPM*. MORE ABOUT US Live Free, Drive Fremont. Prices shown reflect lease incentives. Must lease through VW credit and qualify for all applied incentives. Horsepower calculations based on trim engine configuration. Please confirm the accuracy of the included equipment by calling us prior to purchase. Heated Seats, Keyless Start, Dual Zone A/C, CD Player, All Wheel Drive. PURE WHITE exterior and BLACK LEATHERETTE interior, SE trim. CLICK NOW! KEY FEATURES INCLUDE All Wheel Drive, Heated Driver Seat, Back-Up Camera, Turbocharged, Satellite Radio, iPod/MP3 Input, Bluetooth, CD Player, Aluminum Wheels, Keyless Start, Dual Zone A/C, Smart Device Integration, Blind Spot Monitor, Heated Seats Rear Spoiler, MP3 Player, Keyless Entry, Privacy Glass, Steering Wheel Controls. Volkswagen SE with PURE WHITE exterior and BLACK LEATHERETTE interior features a 4 Cylinder Engine with 184 HP at 4400 RPM*. BUY FROM AN AWARD WINNING DEALER Live Free, Drive Fremont. Prices shown reflect lease incentives. Must lease through VW credit and qualify for all applied incentives. Horsepower calculations based on trim engine configuration. Please confirm the accuracy of the included equipment by calling us prior to purchase. Welcome to Fremont Motor Company, the #1 Volkswagen Dealer in Wyoming! We take exceptional pride in our customer service, and we will do everything to make your Volkswagen car buying experience stress-free and fun. From the time you walk into our showroom, you’ll see why we are the #1 Volkswagen Retailer in Wyoming. For those looking for a little driving EXCITEMENT, check out the all-new 2019 Volkswagen Golf. The Volkswagen Golf comes in 2-door or 4-door version and there are AWD and FWD models available too. 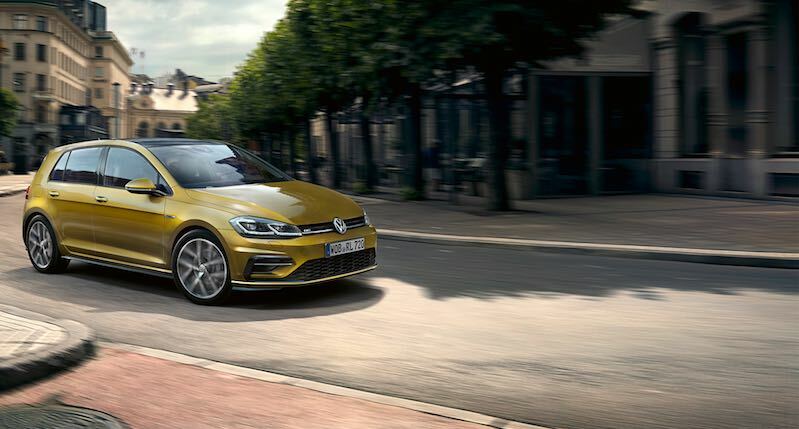 Driving enthusiast will like the fact that the Golf was awarded Car & Driver’s 10Best winner for 2019. There are currently five different versions of the Golf in the 2019 lineup, from wagons (Alltrack and SportWagen) to the hot hatch GTI and AWD Golf R.
2019 Golf R’s are available to order in over 40 different colors. 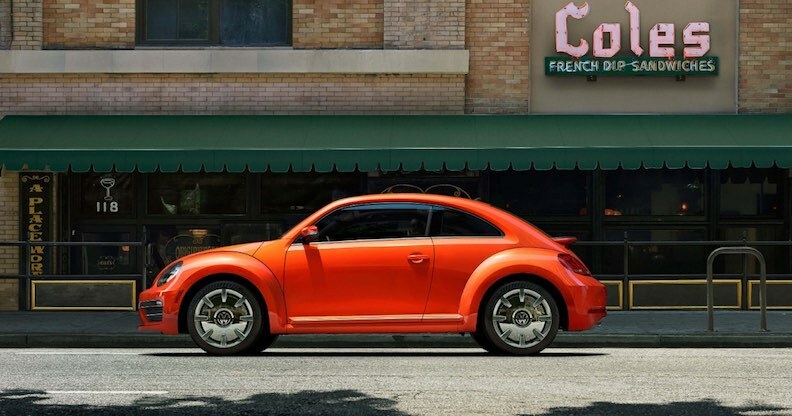 The classic Volkswagen Beetle is still a stellar car that people love. For those that want a little beefiness added to their Volkswagen, the 2019 Volkswagen Dune might be just the ticket. The Dune, with a 2-inch lift and wider tires, definitely makes a statement. While unmistakably a Beetle, the Beetle Dune brings a new edge to a heritage-inspired icon. 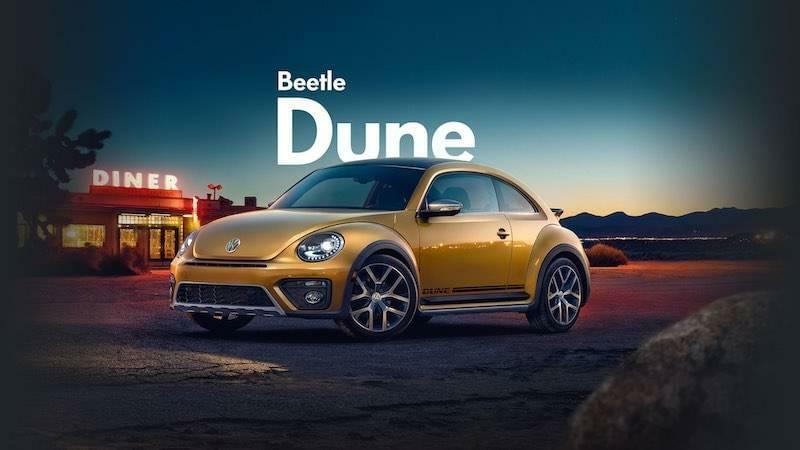 Taking design inspiration from the dune buggy and desert spirit, the Beetle Dune brings a tough attitude to the Beetle family along with thoughtful technologies. For those looking for open skies and fresh air, the Volkswagen Beetle also comes in a convertible and what can be better than driving with the top down on a pleasant sunny day. To take it for a test drive with any of our Volkswagens, come on over to Fremont Volkswagen Casper and have some fun. Also, check out our reviews.